Bespoke Rolex. AMAZING. These guys came up with a military grade coating that "murders" out your Rolie. Not only can you pick from 6 styles, including Submariner and Daytona, you pick the colors of the dials, face, and lettering. You can also have up to 8 characters on the face as well. I think an A Time To Get special edition Daytona is in order. Seriously, these are unreal. 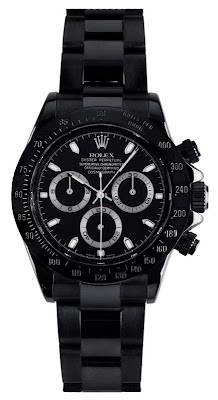 Blacked out Rolex, I mean, really. My life is complete.